Harbor tests of Aleksandr Obukhov, the head ship of the new Aleksandrit minesweeper class, have started in St. Petersburg, the Navy reported. The ship, with a unique fiberglass hull, is to be accepted by the military in November. The 61-meter-long warship is the largest in the world to feature a monolith hull fabricated from glass-reinforced plastic compound. The material combines the low magnetic signature necessary for a minesweeper dealing with magnetic mines, lower mass compared to metal, high strength to ensure survivability and resistance to corrosion that would allow the ship to last for some 60 years. According to the Sredne-Nevsky shipyard, the ship manufacturer, it took only 1.5 days to produce the hull using vacuum infusion technology. Both the speed and the size were record-breaking. One-piece plastic hulls are usually made for ships less than half the size of the Aleksandr Obukhov. In addition to the fiberglass hull the minesweeper has advanced sweeps, submersible drones, and highly integrated and automated control systems. The Aleksandrit-class minesweeper has full displacement of 890 tons, can sail up to 16.5 knots fast and requires a crew of 44 members. It is armed with an AK-306 30-mm anti-aircraft cannon and six SAM missiles Igla for protection. The Navy says it wants at least three such ships deployed. Development of the Aleksandrit-class minesweeper started in 2002 at the Almaz design bureau, with the head ship laid down in September 2011. The ship was launched in July last year. 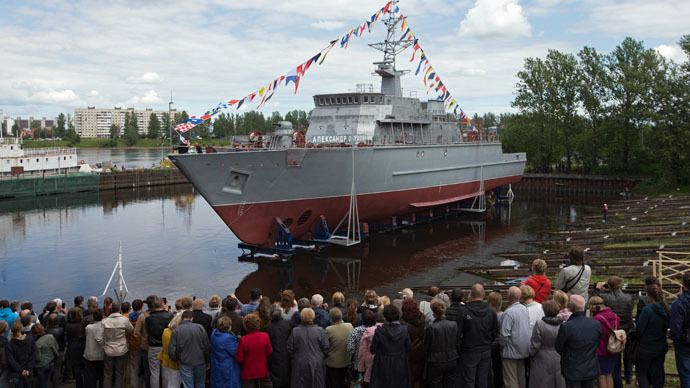 The Navy expects that the shipyard would send Aleksandr Obukhov for its maiden voyage in June and scheduled their own acceptance trials for September.